Most programs suggest that the adopting mother is no older than 45 because of the difficulties that can occur with pregnancy in an older woman. Embryo donors often have age preferences which are part of the matching selection process. Age requirements vary by country. Most countries require parents to be between the ages of 25 and 50, though some have younger cutoffs. Many allow older parents to adopt older children or children with special needs. No specific age requirements. Birth parents however may more readily select parents perceived as neither ‘too young’ or ‘too old’. No specific age requirements. Donor preferences are the guiding factor in most embryo adoption agency matching programs. For married couple, guidelines on length of marriage and number of previous divorces may apply. For singles, countries may prohibit placement or limit the number of children placed. Many countries explicitly prohibit single or LGBT placements. Typically, there are not fixed rules regarding marital status, but some birth parents prefer married couples. Adoptions of babies by singles and LGBT are not unusual. There are typically not specific requirements regarding marital status. Research requirement for singles and LGBT by state. The cost of embryo adoption averages $15,000 which includes agency fees, home study fees and one frozen embryo transfer (FET) fee. A family may have to undergo more than one FET to achieve pregnancy. The adoption tax credit is not applicable. Most international adoption costs range from $35,000 to $50,000. Many families are eligible for the federal adoption (2014) tax credit of $13,190 per finalized adoption. The cost of infant adoption varies widely. The average cost is $30,000. Many families are eligible for the federal adoption (2014) tax credit of $13,190 per finalized adoption. The expenses for foster adoption are minimal and may even include a stipend from the state to help support the child. Many families are eligible for the federal adoption (2014) tax credit of $13,190 per finalized adoption. Embryo adoption allows the adopting parents to become pregnant and give birth to their adopted infant child. At birth the adopting parents are identified as the legal mother and father of the born child. In 2014, 8% of children adopted internationally were younger than 1 year old; 54% were 1-4 years; 38% were older than 4 years. Almost all U.S. private adoptions are of very young babies. Many newborns go home form the hospital with their adoptive parents. Children adopted from the foster system range in age from infants to 17 years old. The average age of waiting children is 8 years old. Many foster children have siblings also waiting for placement. 5. It is important to me to know the complete medical and social history of my child The adopting family will receive information about the embryos and a health history of the genetic parents, as available. The prenatal environment is completely under the control of the adopting parents. The quality of medical and other background info varies widely by county and by adoption situation. Parents will want to research the availability of information in countries under consideration. Medical and other background information is usually, but not always, available in domestic adoptions. Although background information for a child in foster care may be incomplete, current medical information will be available. 6. I can consider parenting a child with some level of disability Medical history may give some information about potential disabilities, but adopting families accept embryos and the children born as a result as their own. Quality of early care varies widely by country. Where foster care is available, children usually fare well. Where children are adopted from orphanages, there are virtually always developmental lags and sometimes other medical consequences. Keep in mind that there are no guarantees of perfect health for any child. Children in foster care may experience consequences from neglect prior to entering care and during care. 7. I am prepared for the visibility and responsibilities of raising a child who is racially dissimilar from me Embryos of all ethnicities are available and the adopting family may choose to accept the embryos they are most comfortable in parenting. The majority of children adopted internationally are Asian, African, or Latin American. Less than 15% are Caucasian (primarily from Eastern Europe) Infants adopted domestically can be of any ethnicity. Of children in foster care currently waiting for adoption 24% are African American, 42% are Caucasian and 23% are Hispanic. Embryo adoption through a clinic or an agency can usually be accomplished within one year. 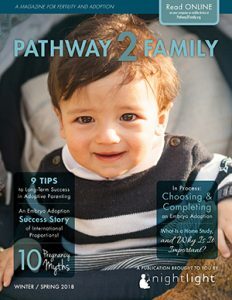 The average international adoption process is two years from start to finish. Wait times vary significantly, depending on circumstances in each country. The timeline is unpredictable. The average adoption is complete within two years. Both for placement and for adoption the wait is unpredictable, but placement can be rapid. 9. I would like to know the total cost of the adoption in advance. Most agencies have set all-inclusive or a la carte fee schedules. Home study fees vary by agency and FET fees vary by clinic. Total adoption expenses usually can be predicted by knowledgeable adoption providers, but unexpected costs can always arise. The cost of domestic adoption can vary widely by agency, advertising costs to identify an expectant mother, as well as birth mother medical expenses. Total adoption expenses are negligible. 10. I am emotionally prepared for uncertainty in the adoption process. There is no guarantee of pregnancy success, but many agencies will place multiple embryos with recipients able to cover the expense of multiple FETs. In most cases, international adoptions follow a predictable path. Families can normally count on becoming parents by the end of the process. Changing laws and practices in individual countries can lead to midstream disruptions. Families who want to adopt a newborn domestically can almost always count on doing so. Yet along the way, as many as 50% of expectant parents who initially consider adoption choose to parent instead. Post-placement revocations are rare. Children may be placed in foster care with families who hope to adopt them when they are legally free for adoption. There can be uncertainty as to when or whether a child will become free for adoption. Embryo adoption agencies will encourage some level of communication between the families whether that is facilitated by the agency or direct between the families. It is mutually agreed upon. In most international adoption, there had traditionally been little or no contact with the child’s birth parents. This is may be changing in some countries. Most birth parents and adoptive parents meet at least once. Usually, birth parent and adoptive parents maintain some contact. If you foster your child before adoption, you may have some contact with the birth parents. If not, you are unlikely ever to have any contact with them. 12. As much as possible, I’d like to control the way the adoption proceeds and choose which professionals I work with. Adopting parents are able to specify their preferences in a match with the donor family. They may choose their home study provider and medical provider. Parents typically choose the adoption country and agency providing services in that country. Beyond that, the process is dictated by the requirements of the foreign and U.S. governments. Adopting parents will choose their agency, social worker, their attorney and sometimes the process by which they identify an expectant mother. The timing of a birth parent match is not predictable. Adopting from foster care involves state adoption offices and courts. it is difficult to have control over the process.